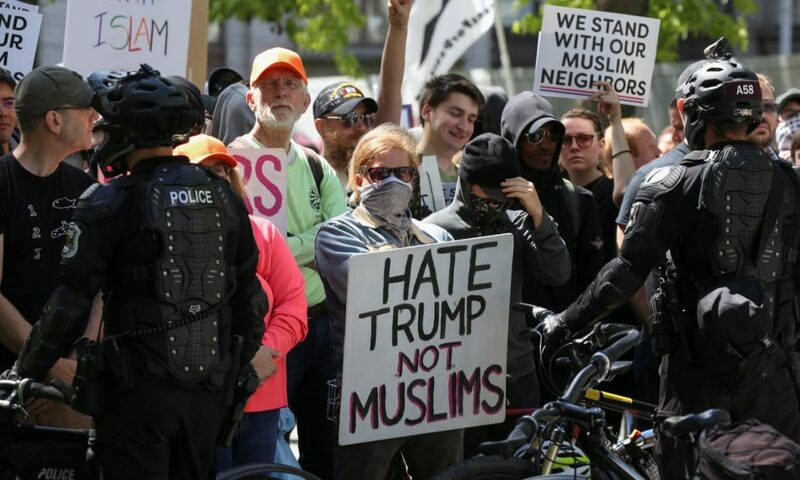 If you were involved in anti-Trump rallies organized in the name of Muslims, fake Muslims, please beware. We need to dig in and find out if Trump’s hatred for Muslims is based on those rallies, which were set up by Russians. Trump is an extremely revengeful man, and if his revenge is based on false presentations, there is hope to mitigate some of it. Putin is hell-bent on making a mockery of successful democracies and wants to upset the systems, create division and discord. He knew that one way to develop loyal supporters for Trump was projecting Muslims as Anti-Trump and place a successful wedge between Americans. The Wall Street Journal interviewed me and now the Tadashi Sugiyama, a journalist for one of Japan’s largest newspapers, Asahi Shimbun. I was listed as a speaker in a rally across White House in September 2016, I did not go there as I disagreed with the Anti-American and Anti-Trump placards they were planning to walk around. I made some placards to be effective, they rejected it, and I chose not to go to the rally. India was such an exceptional pluralistic nation until Modi came along, and I wonder, the communal (religious) riots and the lynching’s were Russian efforts to weaken the vibrant Indian Democracy. Trump’s first few lines on his inaugural address in 2017 were from the letter I had given to him, he included Jews, African Americans, and Indians but excluded Muslims in asking fellow Americans to treat all Americans respectfully. He did it again in the state of the Union in 2019. It is written in Japanese but I quickly translated into English (not perfect, I am sorry). Special counsel, Mueller’s investigation of “Russia Gate” over the 2016 US presidential election ended without confirming the Trump camp conspiracy with Russia. However, aiming at the division of the United States on a theme that produces social discord, such as religion and immigration, Russia’s clever work benefitted President Trump became clear one after another. An activist who received contact from the Russian side explained one end of the trick. The man said he was a member of the group named “United Muslims of America”. It was a demonstration in Washington against Trump’s “Muslim ban”. This group was a fictional one that Russia created to intervene in the presidential race. Mueller indicted 13 Russians including a business man close to Putin’s office last February for using social media to develop organized intelligence operations. The indictment stated that the strategic goal of them was to ” to sow discord in the U.S. political system” Themes that are easy to create divisions, such as immigration, race, religion, etc., were selected, and numerous posts were made online. I think Sharia Law will be a powerful new direction of freedom.” It was a method to superimpose Mr. Clinton on a claim which general Americans oppose, and induce to support Trump. Mr. Ghouse also received some signs by email. Some of them were anti-American. Mr. Ghouse told him, “These signs are not acceptable. Should be more respecting other individuals.” and did not participate. Mr. Trump, who repeats the remarks that divide the society, became the president. Mr. Ghouse thinks Russia meddling was successful. “For democracy to survive, finding the truth is very important. Without check and balance, there is no democracy” Mr. Ghouse said the significance of the investigation of “Russia gate”.